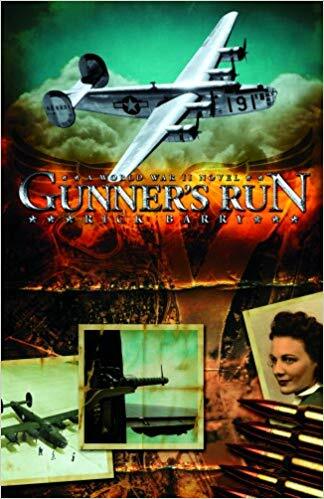 The plot thickens as fictional airman Jim Yoder continues his journey through Nazi-occupied Europe in Gunner’s Run by author Rick Barry. We’re in the final sections of the book, now; have you figured out how it will all end? In 1940, Germany took over France and divided the country. Both sides initially thought the occupation of France would be temporary – until Britain surrendered. However, that didn’t happen and the Nazis stayed in France through 1944. 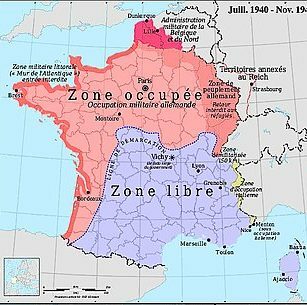 France was divided into two zones – the “Free Zone” to the south offered a puppet-type government capitaled in Vichy and following directives from Berlin while the “Occupied Zone” in the north was directly under Nazi control and kept the Parisian capital. 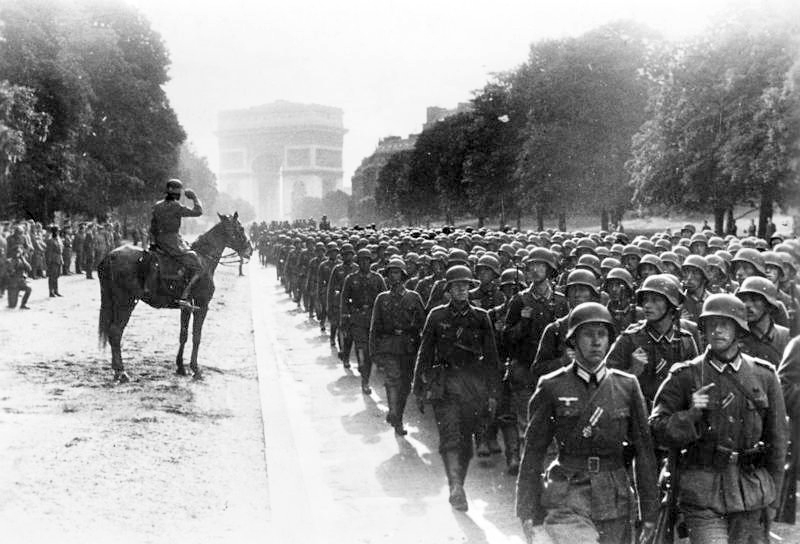 The Vichy government was supposed to be in charge of all France, but had limited powers and could do little to interfere with the happens in the occupied zone. To the Allied victors and French resistance fighters the Vichy government were collaborators. Thus, France was divided political and nationally during World War II. Charles de Gaulle led the underground French Resistance movement in France against the Vichy government and the Germans. He organized and led a government in exile in England, staying in communication with Free French supporters and Nazi resisters in his home country. Eventually, after the war, he became the leader of France and advocated for democracy. Here’s a simplified video about the French Resistance during World War II. It’s a good overview of the organization, how it came into being, and some of its missions during the conflict. Some of the most striking photographs from occupied Europe during World War II were taken in Paris. The historic and famed “City of Lights” headquartered Nazi occupiers and hosted a network of Free French underground fighters, spies, and sabotagers. Curfews, strict rationing, German propaganda, disappearance of French Jews, bartering on the black market, forced labor, and stolen artwork became common occurrences. Some citizens collaborated with the Germans, hoping for better treatment. Others fought back open while others worked behind the scenes. As Allied spy networks and secret communications improved, resistance members in Paris (and other parts of France) passed valuable information to the intelligence divisions in England. During the Allied invasion and advances in the summer of 1944, French Resistance fighters in Paris helped to retake their home city from the Nazis. In the story some is concerned about infiltration. The Germans might send an English-speaking individual to the resistance ring in an effort to get in and then lead the police to make arrests of Allied supporters. Resistance groups were always on the look out for informers in their own ranks and new suspicious members. Sometimes the agents were German sent, other times they were locals who agreed to betray in exchange for something from the Nazi occupiers. The trouble with underground organizations and spies for historians is figuring out who did what. Many perished. Others “disappeared” after the war and died peacefully in later years without telling what they did. Although there are records, primary sources, and oral history about the underground resistance organizations and individuals from World War II, there are still knowledge gaps and case where we can really only wonder. Chapters are supposed to end with hooks to make the reader need to continue. Did you notice the final sentences in these chapters? Aside from Chapter 22 which needs more context for its drama to make sense, all of these sentence can stand alone and make a reader need to know more. Added in the story and placed as the final words to the chapter makes a winner in YA historical fiction and a page turner. If you’re a writer – fiction or nonfiction – always think about the final sentence and word of your chapters. It can really make a powerful difference to the pacing and interest of the story.